For two years now I've entered a turbo-niche Halloween painting competition where entrants have to paint one piece from Citadel Miniatures' insanely characterful Night Horrors or Gothic Horror ranges – the two 1980s ranges designed to support Games Workshop's Call of Cthulhu licence. 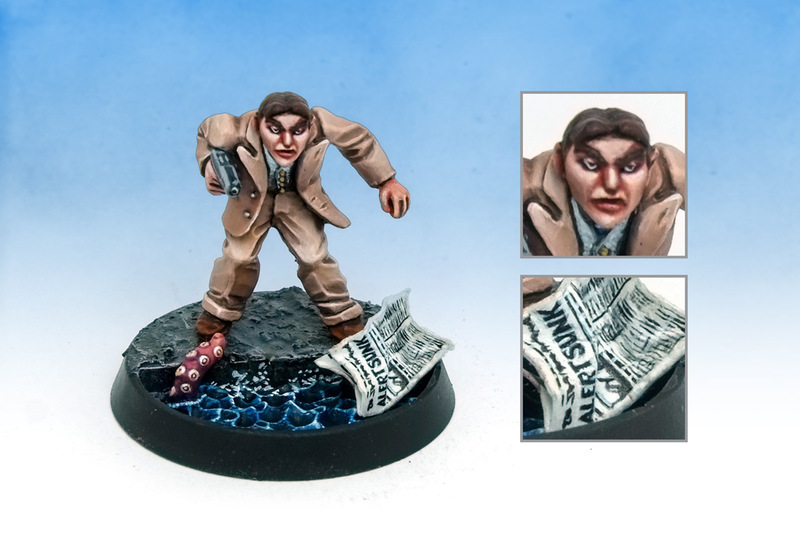 As last year I painted one half of the classic Citadel LE3 Gumshoe Detectives duo, Bogart, it seemed only right this year to paint his partner – Cagney. The newspaper on the base is a rendition of the Sydney Morning Herald , with the he headline ALERT SUNK is a reference to the Call of Cthulhu story where Cthulhu gets his head rammed over by the steam yacht Alert. (Thanks for coming up with that idea, Michal.) 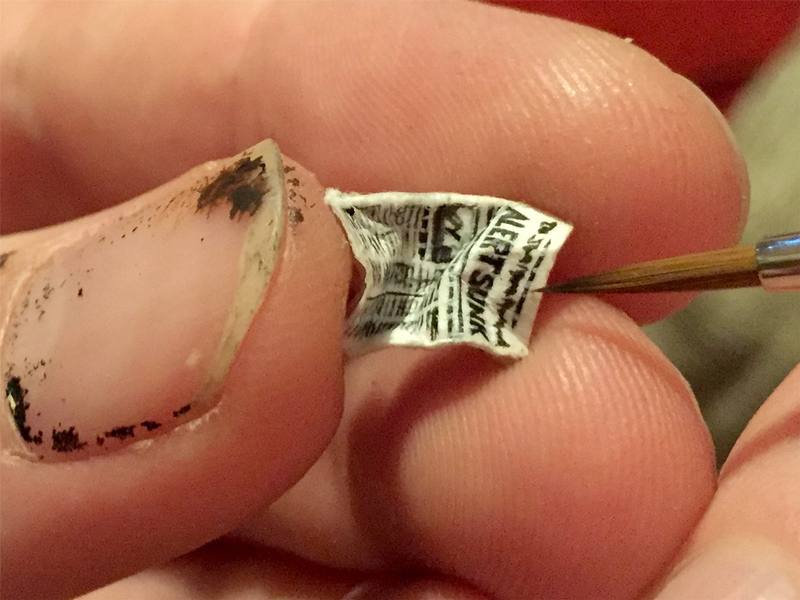 I painted the headline as small as I could on a piece of thin card and then cut it out so I didn't have to worry about the normal freehand space constraints. With the newspaper done, I figured I'd model the base as Sydney harbourside. The lapping waves effect were taken from sho3box's Man O'War Nurgle fleet (thanks sho3y). I added a Chaos Spawn tentacle to explain why Cagney's drawn his gun. With that done, I figure he's firmly anchored in the lands of Call of Cthulhu investigator. 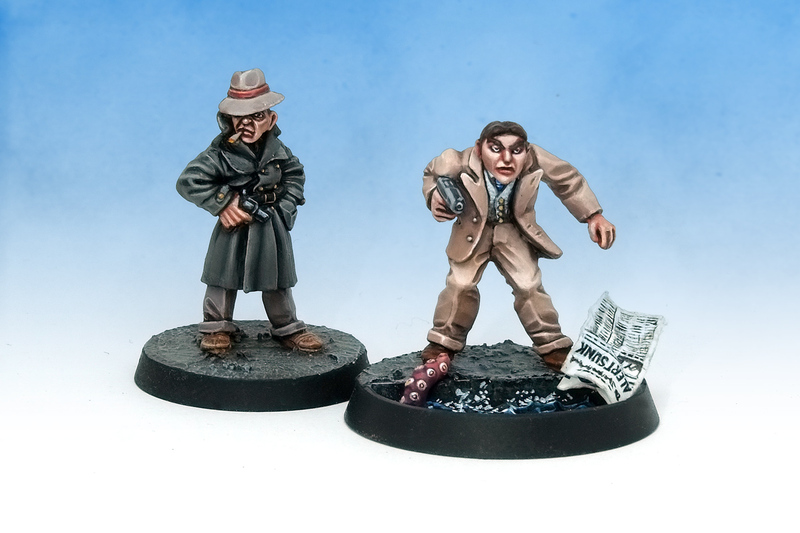 The LE3 Gumshoe Detectives, while part of the Gothic Horror range, are also part of the numbered limited editions series that Citadel Miniatures pumped out in the late 1980s. I'd like to paint up all twenty five of the codes, and am planning the LE1 Space Orc soon. Gotta think what to do for next year's entry now. 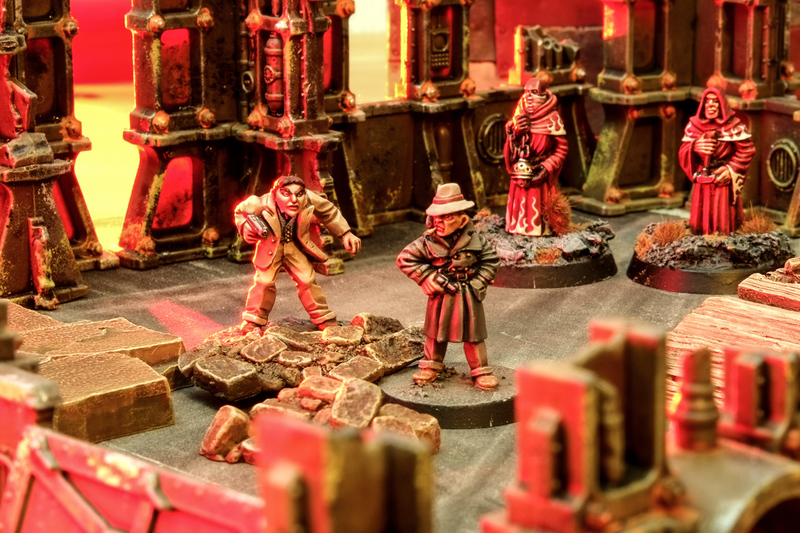 The Night Horrors range and Gothic Horrors are chockful of characterful one-off miniatures. Both detectives were resculpted at least twice for rerelease later in the Gothic Horror range, so I'll see if I can track down those. 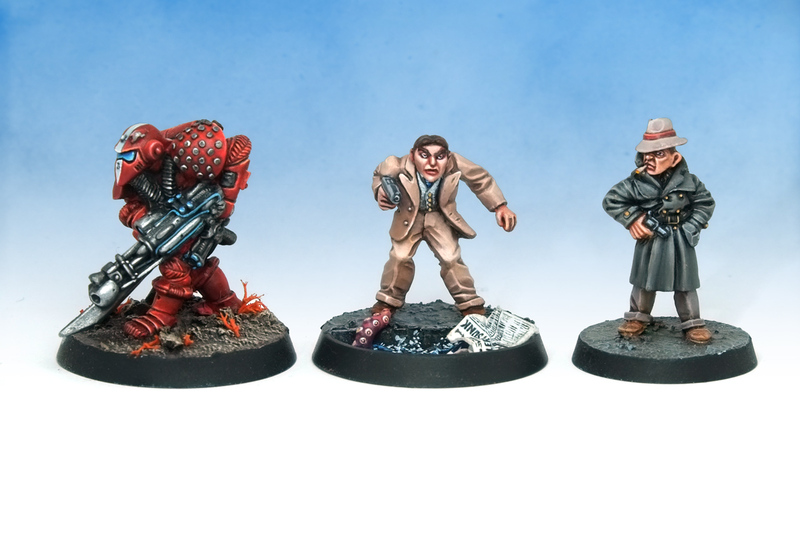 I'm also obsessed by the Doctor Who miniatures that were slightly resculpted and released as Gothic Horror pieces too! Roll on 2019's competition! In related news, I won a statuette at Golden Demon this weekend, and I'll be publishing the stage-by-stage tutorial on Patreon later this week. Great stuff; love the newspaper. Absolutely brilliant! Beautiful painting and well thought out. Loved the newspaper! Un Sacrificium Parvis ob Adagnitio" (A Small Sacrifice for Knowledge), motto of Miskatonic University, Arkham, Massachusetts. You HAND PAINTED that newspaper headline ??!!?? You are a SUPER fine painter, and may have sold your soul to the devil in return for supernatural painting skill. I have the Boggie figure. I have had him for ever and have never gotten around to painting him. Perhaps I'll get him out to paint some day. Love your work. Always very inspirational. I have that figure too – mine is also rather nicely painted- not sure where he is though…. Yeah, chicklewis, the newspaper was done be hand. I foolishly announced that was what I was planning for the base in the Facebook group, and I was honour-bound to make it happen. Took a lot of practise attempts and redrafting of the actual headline.